Size of this preview: 716 × 599 pixels. Other resolutions: 287 × 240 pixels | 574 × 480 pixels | 717 × 600 pixels | 918 × 768 pixels | 1,224 × 1,024 pixels | 6,001 × 5,022 pixels. 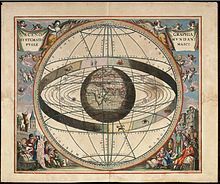 English: From Andreas Cellarius Harmonia Macrocosmica, 1660/61. Chart showing signs of the zodiac and the solar system with world at centre. Plate 2: SCENOGRAPHIA SYSTEMATIS MVNDANI PTOLEMAICI - Scenography of the Ptolemaic cosmography. Title: Scenographia systematis mvndani Ptolemaici [cartographic material]. Physical Description: 1 map : col. ; 38 cm. in diam. Notes: "444" in top right hand margin in pencil. Français : Extrait de l'Harmonia Macroscomica d'Andreas Cellarius, 1660/61. Figure montrant les signes du zodiaque et le système solaire avec la Terre en son centre, selon le système de Ptolémée. Author Loon, J. van (Johannes), ca. 1611-1686.